You are provided with a maximum 10 weeks to complete the course once you commence. This course is delivered online via e-learning. The Professional Diploma in Digital Marketing focuses on the commercial aspect of online marketing. The Professional Diploma in Digital Marketing is a practical course designed to help you improve your business’s online lead generation and customer engagement. The Digital Marketing Institute is the global certification body for Digital Marketing education. Exclusively designed by practicing Digital Marketing professionals, the Professional Diploma in Digital Marketing carries the coveted Digital Marketing Institute accreditation and associated brand recognition, which is highly sought after by employers. The professional diploma in digital marketing has been credit rated by SQA at Level 8 on the Scottish Credit and Qualifications Framework (SCQF). SCQF level 8 corresponds to level 5 on the European Qualifications Framework (EQF) and corresponds to a Diploma on the Australian Qualification Framework (AQF). The cost includes all course materials and the examination fee (first attempt only). All aspects of digital marketing are included in this course. From the course overview, you will see that the Certified Digital Marketing Professional course. The Certified Digital Marketing Professional is approximately 30 hours of digital marketing course content. 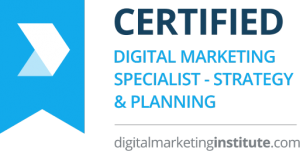 The Certified Digital Marketing Professional course is delivered online. So you can access your digital marketing course content anywhere and anytime you want. You are provided with a maximum of 10 weeks to complete all the modules. Note: You have 24 weeks from your course end date to take your exam. Please note this date cannot be extended. The examination for professional certification is a 3-hour computer-based test consisting of closed-ended questions in the following format: multiple choice, image-based multiple choice, true/false, “drag and drop” (matching) and “hot spot” questions. The exam is split into three sections; candidates need to achieve a minimum of 60% to pass the exam. Each examination contains approximately 200 questions. All Digital Marketing Institute examinations are delivered through PeopleCert’s Online Proctoring system, allowing you to take the exam at your convenience in the comfort or your home or workplace. You have 24 weeks from your course end date to take your exam. Please note this date cannot be extended. Note: our team will explain the options and process in detail with you. This course has no prerequisites and is categorised as an Entry Level course by the Digital Marketing Insititute. All Digital Marketing Institute examinations are delivered through PeopleCert's Online Proctoring system, allowing you to take the exam at your convenience in the comfort or your home or workplace. The Certified Digital Marketing Professional course is delivered online. So you can access your digital marketing course content anywere and anytime you want. The Professional Diploma in Digital Marketing focuses on the commercial aspect of online marketing.